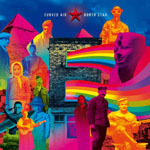 Share the post "Album review: CURVED AIR – North Star"
Another heritage band who for the past years have been re-acquainting audiences with their brand of quirky progressive art-rock. Sonja Kristina still retains her intriguing allure and the band is now bolstered by one-time (1972-3) guitarist Kirby. Kirby’s arrival has given this new offering a rockier edge, as evidenced on the excellent opener ‘Stay Human’, ‘Interplay’, ‘Old Town News’ and ‘Young Mother’. ‘Time Games’ features Kirby playing off Paul Sax’s violin with an almost Mahavishnu-lite flourish and, similarly, the excellent instrumental ‘Spider’ enters jazz-rock territory with some style. But the album is something of a tour-de-force for Kristina too whose vocal work has been directed by her sometime Mask collaborator Marvin Ayres. Here she revives ‘Situations’ from the band’s 1970 debut, ‘Puppets’ and ‘Young Mother’ which first appeared on ‘Second Album’, and ‘Colder Than A Rose In Snow’ from her debut solo album. On ‘Images And Signs’ she comes across as a Patti Smith mixed with Marianne Faithfull but still more mysterious and sexier than either, whilst the infectious ‘Magnetism’ develops into an absorbing instrumental workout for keyboard player Robert Norton and the guitarist. With suitable visuals and a pungent aroma in the air I am sure this will go down very well in the live context where at last the band seem to have found a convincing, stable and authentic modern line-up. It seems the new songs had already been written when Kirby replaced Kit Morgan late in 2013 so we assume that with the new guitarist now firmly on board there could be more musical fireworks – and at least more originality – in terms of future albums. This entry was posted in ALBUM REVIEWS, ALBUM REVIEWS (Mobile), All Posts and tagged album, Curved Air, Kirby, North Star, prog, Progressive Rock, review, Sonja Kristina. Bookmark the permalink.